Manager Matt Wright says Chichester City Ladies will be up for the challenge of taking on Liverpool in the next round of the Women’s FA Cup. The dream tie was set up by the Green Army’s win on penalties away to The New Saints in Sunday’s fourth round. The game finished 1-1 after extra time, but Jess Lewry scored the winning penalty to send Chi into the next round. Cherelle Khassal scored the equaliser for City in the second half to take it to extra-time, which couldn’t separate the sides. Liverpool, currently third in the top division of the Women’s Super League, progressed into the fifth round by thrashing Watford Ladies 5-0. The victory was overshadowed by a nasty collision during the game in which captain Emma Alexandre sustained a head injury. She went to hospital for a CT scan and is now said to be on the mend. But she is set to miss the Liverpool tie while Laura Ingram will be absent with a pulled quad. Hollie Wride, Lucie Challen, Gracie White and Lou Robson are also on the injury list and likely to miss the big game. Liverpool Ladies play two division above Chi, who play in the Premier League South, and they will meet at Oaklands Park on Sunday, February 18. A massive crowd is expected. Chi City Ladies manager Wright, said: “I’m pleased we won the game, probably not pleased with the manner in which we won. We could have been better. “We played some good football in places but we were well below par at other times. If we had been more clinical, we would have finished the game a lot earlier. Before the game, Wright knew the players could get a result to take them through to the fifth round. “We go into most games confidently, we know we’ve got the players, and the skill-set to win games. 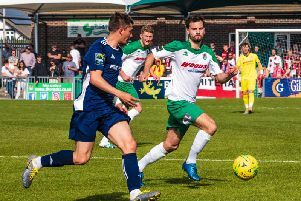 We’ve got some fantastic individuals and a fantastic team ethic at the club, so we were quietly confident that we could get a result.” Wright said. “There were a few choice words (at half-time). We trained really well, our preparation for the game was fantastic, it just wasn’t reflected on our first-half performance, so we had to work very hard from half-time and the players stepped up to what we asked. Wright was hoping to draw Liverpool at home – and his wishes came true. Wright said: “I am absolutely over the moon with the draw, we are hoping to give it a real home advantage. They won’t be used to coming to play at Oaklands Park, so we’re hoping that will give us a little edge over them. It will be a great day for the girls. “Our preparation will be very solid. We’ll train through the week prior to the game, and we’ll train to play how we are going to play against Liverpool.